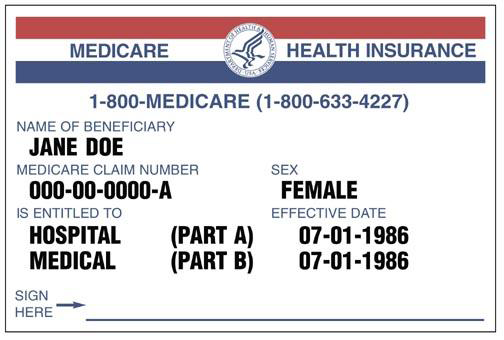 What does a Medicare card look like? Is there a cost for Medicare? How do I join original Medicare? Can I enroll in Medicare outside of my seven month window? A: Medicare is health insurance from the federal government for Americans age 65 and over, and some people under age 65 with certain disabilities. It is not based on your income. It provides partial coverage for medical costs. Q: Is Medicare the same as Medicaid? A: No. Medicaid is a jointly-run federal and state program for people wth lower incomes who meet the income and asset limits and are age 65 or over, blind, or have a disability. Q: Can someone have both Medicare and Medicaid? A: Yes. Some people with lower incomes qualify for both programs at the same time. Q: What are the parts of Medicare? Part A: Hospital care: Covers care you receive in inpatient hospital settings. Part B: Medical care : Covers your doctor visits, lab work, durable medical equipment, outpatient services, etc. Together, Parts A and B are sometimes called Original Medicare or Traditional Medicare. Part C (Medicare Advantage or Medicare Health Plans): Optional, privately-run health plans that substitute for Original Medicare as long as you have the plan, and sometimes include Part D. These plans must provide the same benefits as Original Medicare, but may provide them in a different way (such as with different copays or coinsurance). If you leave a Medicare Advantage plan, you return to Original Medicare. Part D: Optional, privately-run prescription drug plans. These may be stand-alone plans covering prescriptions only, or be included in a Medicare Advantage plan. Q: What does a Medicare card look like? Q: Is there a cost for Medicare? A: Part A (hospital coverage) is typically premium free because most people have paid into that program during their working years. Some people may have to pay a premium if they (or their spouse) earned fewer than 40 credits (often worked fewer than 10 years) in jobs that paid into Medicare. Part B (medical coverage) typically has a standard monthly premium. Some people with higher incomes may have higher premiums. As of 2015, the standard premium was $104.90 per month which is deducted directly from your Social Security beneifts if you are receiving Social Security. Q: How do I join original Medicare? A: If you started getting Social Security retirement or disability benefits before age 65: The Social Security Administration automatically enrolls you in Medicare Parts A and B. Medicare will let you know the effective date, and will also give you the option to defer Part B. You will need both Parts A & B in order to take a Medicare Supplement plan or Medicare Advantage plan. If you have not yet applied for Social Security benefits: You will need to enroll in the parts of Medicare that fit your situation. This will not happen automatically. You may join Medicare Parts A and B during your Initial Enrollment Period - the seven month window surrounding the month of your 65th birthday. This includes the three months before your birthday month, the month of your birthday, and the three months after your birthday month. Q: Can I enroll in Medicare outside of my seven month window? Special Enrollment Period 1: If you're covered under a group health plan based on current employment, you have a Special Enrollment Period to sign up for Part A and/or Part B any time as long as you or your spouse (or family member if you're disabled) is working, and you're covered by a group health plan through the employer or union based on that work. Special enrollment Period 2: You have an 8-month Special Enrollment Period to sign up for Part A and/or Part B that starts the month after the employment ends or the group health plan insurance based on current employment ends, whichever happens first. The General Enrollment Period occurs every year from Jan. 1 March 31. Your coverage will start July 1, and you may have to pay a late-enrollment penalty. A: If you change from a Medigap to a Medicare Advantage plan or other replacement plan, its up to you to cancel your Medigap/Medicare Supplement coverage. If you paid a yearly premium for your Medigap plan, the law does not require the plan to refund you any portion of that premium. Do not cancel your old plan until you verify you are active in your new coverage. A: Medicare select policies supplement the benefits available under the Medicare program and are offered by insurance companies and health maintenance organizations (HMOs). Medicare select policies are similar to standard Medicare supplement insurance but the covered services must be obtained through plan providers selected by the insurance company or HMO. Each insurance company that offers a Medicare select policy contracts with its own network of plan providers to provide services. Medicare Select insurers must pay supplemental benefits for emergency health care furnished by providers outside the plan provider network. Medicare select policies typically deny payment or pay less than the full benefit if you go outside the network for non-emergency services. However, Medicare still pays its share of approved charges if the services you receive outside the network are services covered by Medicare.